Kala has extensive calculations, as you can see below. Best of all, Kala is the only Jyotish software that calculates Planetary War, Combustion, Vara, Hora, Vyatipata, Vaidhriti and Sankranti according to the Surya Siddhanta, Varahamihira and other classical astronomy texts. Furthermore, Kala is the only Vedic Astrology software with extensive Muhurta calculations and the only software to program the entirety of mathematical techniques from Brihat Parashara Hora Shastra. Kala is thus the premier software for studying and practicing Classical Vedic Astrology. On a more modern note: Kala has the most accurate planetary calculations, thanks to the extremely accurate Swiss Ephemeris - which is an astrologically designed version of the most accurate NASA JPL ephemeris. 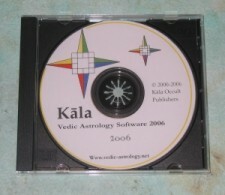 Kala is thus the most accurate software available to the Vedic Astrologer. Kala is able to calculate planets perfectly accurately for modern days, but also most accurately all the way from 5400 BC to 5400 AD, as compared to many other software which begin to show significant errors even when calculating only 150 years back. Important Ages for the planets. Vedic Equal, Sri Pati, Placidius and several other house systems. KP option of putting the house cusp as the beginning of the house. Nakshatra lords and sub lords shown down to five levels. Combustion of Planets - only software that calculates this phenomenon correctly in accordance with Surya Siddhanta and Varahamihira. Option to have Kala only display the conditional Dasas that apply to the horoscope. King, Minister and other lords along with results. Fatal Degrees - "Mrityubhaga" - for all Vargas. Only software that has the option to calculate Bhava, Hora, Ghatika and Pranapada correctly according to Brihat Parashara Hora Shastra. All these calculations are combined with the Avasthas of Parashara so as to provide a predictive foundation. Nakshatra, Pada, Nakshatra Lord and Sub-lord down to five levels. Outer Planets - Pluto, Uranus and Neptune, Toggle On and Off with a push of the F8 Key. Correct Chestha Bala as per Parashara, not the short cut method based on declination that other softwares use. Combustion, both contemporary method and method of Surya Siddhanta and Varaha Mihira. Transit Calendar of sensitive transits for each of the Houses.